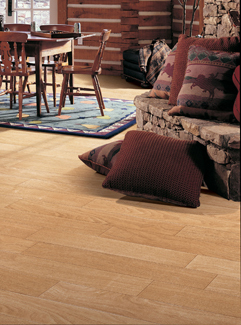 Wood Look Tile | Swansea, ILWe have a new 800 number, but you can still call us at 618-234-2915 if you prefer. Maximize the value of every dollar you spend on your home when you choose from our extensive selection of wood look tile in Swansea, IL. The choice of tile made from porcelain and ceramic at Collins Flooring America includes products from the major manufacturers you have come to love. The homes of today need smart solutions that provide the owner with the look they want and the durability they deserve. The character and charm of hardwood flooring are hard to duplicate in rooms with higher levels of moisture. Traditional wood planks expand and contract when exposed to spills that invariably occur in kitchens and bathrooms. A smart option for decorators interested in durability and charm is this innovative new product that looks as natural as the wood in your den. We carry porcelain and ceramic tile with an advanced top layer that replicates the appearance of natural hardwood. Each is produced through the firing of specialized clays at specific temperatures. The finished tiles are them imprinted with a vivid photo layer that mimics the texture and grain of stone and wood. Collaborate with a group that takes the time to personalize your design theme and get an interior that you are sure to love throughout the coming years. When it comes to the kitchens and bathrooms in area homes, tile is a mainstay. In the hands of a creative contractor, these tiles can be cut into a broad array of patterns and shapes. As a denser type of tile, porcelain makes a better option for covering walls and outdoor spaces. Our wood plank porcelain tile takes every design in a new direction. The water resistance of this product depends on proper grouting and sealing, so choose a team that specializes in this type of flooring for greater success. The choice for the homeowner is evident when they consider the durability and resiliency of this product. Decorate the walls of any room with tile that matches the comfort and character of wood. Protect the interior of your home from the added moisture you can expect in a bathroom. In the hands of a creative installation specialist, our wood plank ceramic tile can cover more of your floor than ever before. Tile is also easier to heat and cool, so you can remain comfortable during any season of the year. When you make an investment in ceramic wood tile, you get a floor that looks great for years to come. When you combine our porcelain tile with professional installation, your project is sure to prove successful. Contact us to learn more about the rooms in your home that can benefit from wood look tile. We proudly serve customers in Swansea, Belleville, Fairview Heights, Waterloo, Collinsville, Illinois, and the surrounding communities.